This pumpkin cheesecake Danish braid only looks harder to make than it is. Inside the flaky pastry is a creamy, warmly-spiced pumpkin cheesecake filling. Welcome to Day 2 of #PumpkinWeek! One of my favorite weeks of the year! Did you read about the giveaway prizes and enter to win yet? If not, click on over to Monday’s post to get all the info you need. 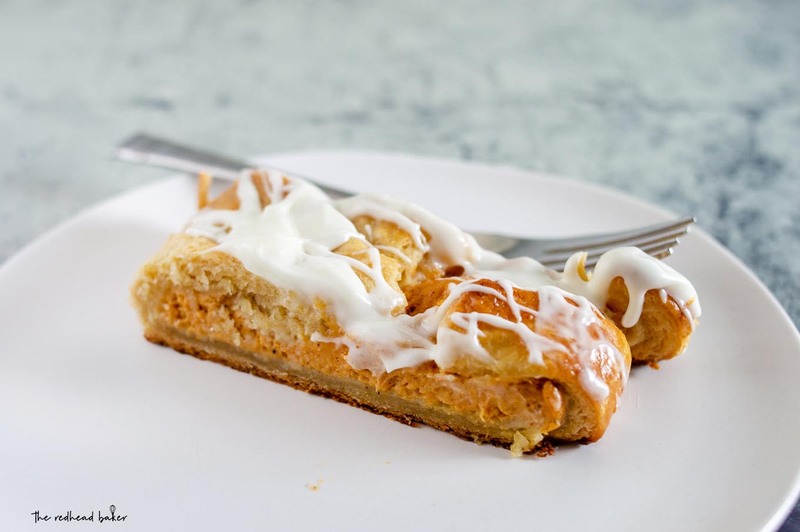 Today’s pumpkin recipe is one of my favorites—a pumpkin cheesecake Danish braid. I made an apple variation on this earlier this year. I use a food processor to help cut down on the time and effort of laminating the butter in the dough. The result is still a tender, flaky pastry. I love making Danish braids, because the presentation is so beautiful, and it looks like it was a lot of effort to make, but it’s really not. Yes, there is yeast involved, but the beauty of instant yeast is that you don’t need to proof it in warm water, so there’s no worries about water temperature being too hot or too cold. I don’t worry too much about rolling my dough to exactly 11 inches by 14 inches, either. I mean, roughly, yes. But I don’t break out a measuring tape. Part of the beauty of a Danish braid is that it should look a little rustic. It’s better to err on the side of too wide than not wide enough, because as you can see in the photo above, strips that aren’t wide enough won’t stay in place during baking. And let’s not forget the filling. The creamy, cinnamon-y, pumpkin-y filling. It smells SO GOOD while it’s baking. It’s much thicker than actual pumpkin cheesecake batter, so that it doesn’t run all over while you’re trying to spoon it down the center of the pastry during assembly. The icing is optional; this would also be delicious with a nice coating of sifted powdered sugar. If you choose to go with the icing, use the measurements as a guideline. If your icing is too thick to drizzle, add more cream or milk by the teaspoonful until you get to the desired consistency. Also, if you like, feel free to substitute maple extract for the vanilla, which would complement the pumpkin flavor nicely. 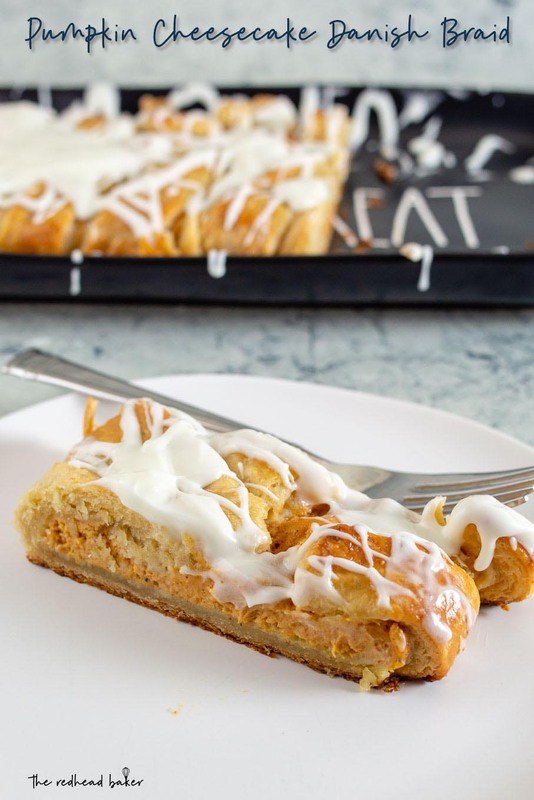 This pumpkin cheesecake Danish braid looks harder than it is. 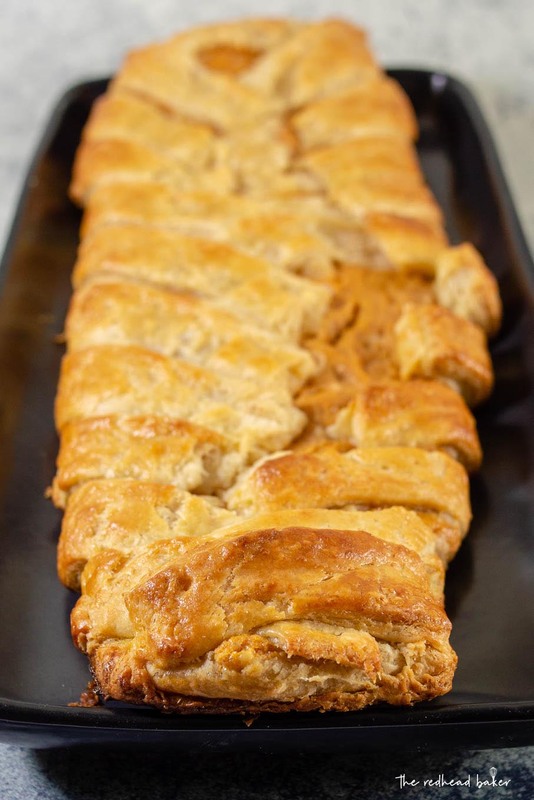 Inside the flaky pastry is a creamy, warmly-spiced pumpkin cheesecake filling. 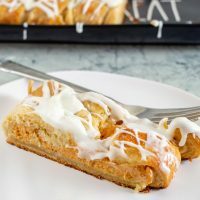 On the day you plan to bake the braid, make the filling: in a small bowl, beat together the cream cheese, pumpkin, sugar, spices, and vanilla. Set aside. On a lightly floured silicone baking mat, roll the dough into an 11-by-14-inch rectangle. Arrange so a short side is facing you. With a bench scraper or the backside of a knife, very lightly mark off a 3-inch section lengthwise down the center of the dough. (Don’t cut through the dough, you’re just creating a guide for yourself.) Cut 1-inch strips perpendicular to the lengthwise guidelines with a bench scraper (never use a knife on a silicone baking mat), on either side of the 3-inch section. Cut off the top and bottom corner strips, leaving the center flap. Spread the pumpkin cream cheese mixture down the 3-inch section of the pastry, leaving about an 1/8-inch border on all sides. Fold up the top and bottom ends of the center section to create a barrier for the filling. Starting at the top, fold each strip in at a slight angle over the filling, alternating from left to right. Make sure the strips are overlapping by about 1/2 inch so they don’t open up while baking. 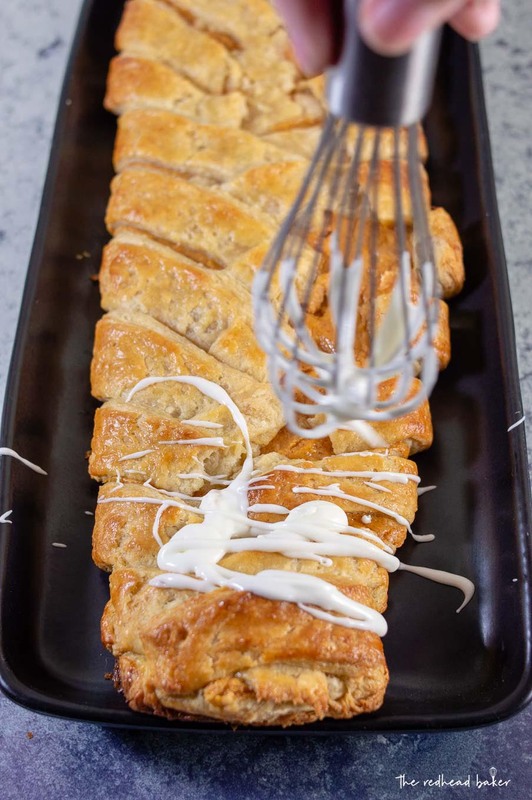 Gently slide the silicone baking mat with the Danish braid onto a rimmed baking sheet. Oh my YUM….this has me drooling all over my laptop.